We’re animals. Like every other animal that ever existed, we have traits that are common to all animals, plus traits that are peculiar to our species, Homo sapiens. What are the traits that relate to nutrition and your body’s function? What are some basic nutrition rules? 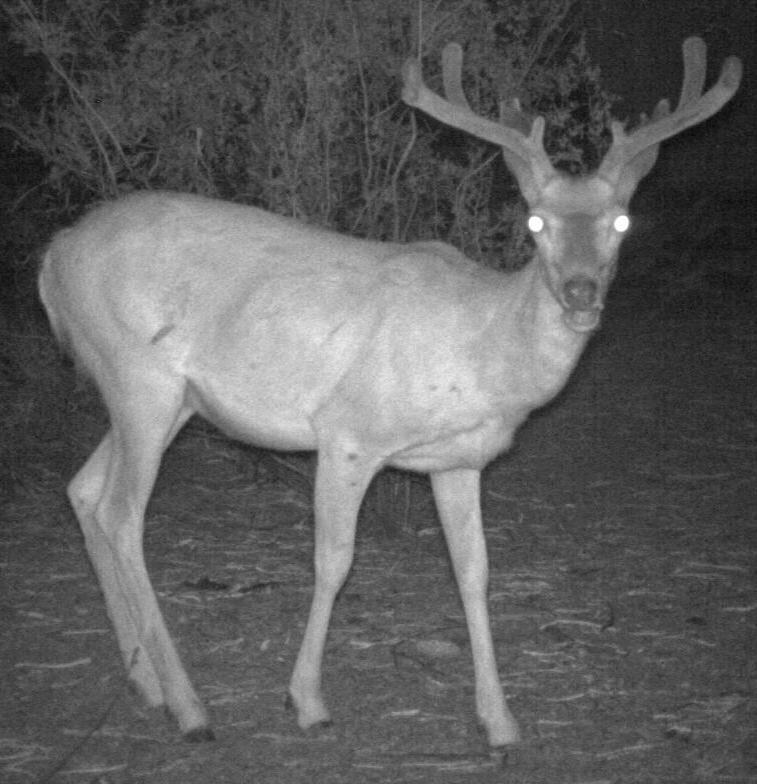 The mule deer buck in our wildlife camera photo is an animal that does well on a plant-based diet. Herbivores like this deer have all kinds of adaptations to that carbohydrate-based fibrous diet. Adaptations we don’t have. We let deer and their bigger herbivore brethren digest the plants, then we ate the herbivores. Technically, we’re omnivores. There are plenty of plant products we can eat and get good nutritional value, but they need to be the easy to digest parts of the plants–fruits, berries, nuts, and some leafy and/or starchy materials, often heated to soften them enough for our small teeth to chew. Your body can only store energy as fat, except for a tiny buffer of glycogen. Whatever the source, calories from the carbohydrates, protein, and fats that you eat almost all gets stored as fat. Your body doesn’t count calories in food and drink. Yes, you can count them, but your body doesn’t know or care if you are. Typically, if you don’t eat enough calories to sustain your normal metabolism, your body will respond as if you’re being starved to death. Not so good. If you eat the mix of foods that’s normal for your species, your body will adjust appetite, intake, and activity levels to sustain a normal body composition. Not too fat, not too thin. Healthier, too. Your body processes different foods differently. For example, if you eat food with a lot of sugar or carbohydrates that digest quickly to sugar, your body is wired to keep eating until the sugar is gone and to make as much of the sugar into fat as possible. If you eat a high fat diet with very little sugars, you’re wired to eat less. If you eat foods that aren’t normal for your kind of animal, your body will respond in strange ways. Depending on where your genetic weak points are, you may get sick in ways that used to be pretty unusual before the 20th Century. Obesity, diabetes, heart disease, cancer, dementia, depression, and other problems come to mind. Food and drink with a lot of sugar or carbohydrates that become sugar quickly are the worst. Sugar will make you sick over time, the only question is what form the sickness takes. The temperate zone vegetable oils like soy, corn, canola, etc. aren’t normal either. Hydrogenated or heated, they’re downright toxic to any kind of animal. Practically all fried foods are cooked in these oils today. Strangely enough, what’s normal/optimal for the human animal is food with a high fat content and often practically no carbohydrates, from animals, nuts, and some tropical vegetable oils like coconuts. See Biology. Exercise doesn’t matter very much if you are eating the wrong foods for your kind of animal. You can still get sick. Exercise helps your body function normally if you’re eating the normal foods for your species. There’s a synergistic effect.